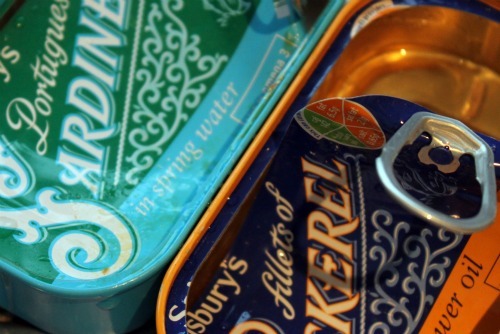 Beyond the design of the tins there are many reasons to have tinned fish in your store cupboard at all times. They will pull you out of a tight spot at supper time any day of the week. We love fish cakes in this house. I always make more than I need so I have a good stock of them in the freezer. Far nicer than fish fingers and just as easy to pop in the oven when you’re short of time. This tinned fish version I make has an advantage over its fresh couterpart in that you eat the whole fish bones and all. The bones are a good source of calcium and mackerel and sardines happen to be one of the best dietary sources of vitamin D which means the calcium has what it needs to be absorbed. I serve them with either salad or vegetables and a big dollop of Greek yoghurt. Boil your potatoes until they are cooked. Drain and set aside – the longer the better as it will let the water out. Open the tins and drain the fish. 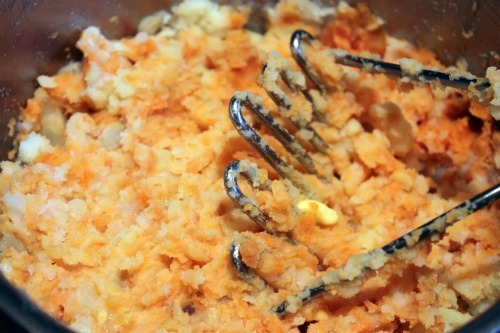 Mash the potatoes until they are fluffy either with a fork or a ricer. Put the fish into the bowl and fork it through the potatoes until they are well combined. If you are worried about the bones get your fingers in there and you’ll see they just crumble in. Now you can shape your fish cakes. I use a tablespoon measure to portion each cake. Roll each fish cake in the flour and pat dry. Place on a baking sheet and cook for 20 minutes in the oven. Once out of the oven let them stand for a couple of minutes before serving. I’ve been wanting to try these since I saw the post. My children love normal, shop bought fish fingers but I wanted to be able to give them something a bit different. Food has been tricky in this house for the last few years. Son number one has been very particular about what he eats probably due to the chemo he’s been on since July 2008. His treatment for childhood leukaemia has been a long one but I think he is starting to get his sense of taste back, having stopped chemo in September. It’s only now that he’s getting back to ‘normal’ that I appreciate how much of his ‘fussiness’ was down to the drugs in his system. Anyway, keep the recipes coming, this one was a hit with all the family. 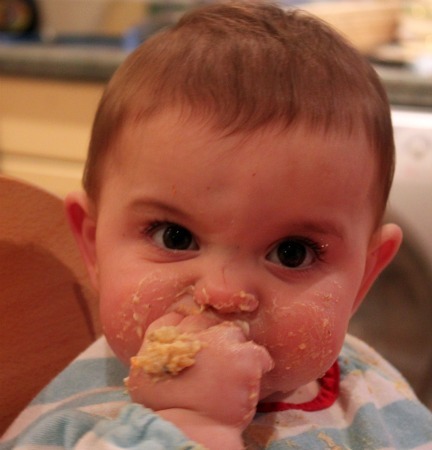 I had to feed the unbaked, mashed stage to babykins when we got back from the school run he was so hungry. It stuck to the spoon well so we were both happy. These sound nice and easy and I reckon my kids might like them! Will give them a go – thanks!